When you notice that your gums are bleeding or that your breath seems chronically bad, you might consider the periodontal disease that causes it to be quite a nuisance. However, the truth is that it’s much more than that; periodontal disease is one of the most common chronic dental issues, and the most common cause of adult tooth loss. With over 80% of adults affected by it to some degree, controlling periodontal disease is an important aspect of many people’s routine dental care. Because periodontal disease is progressive, treating it depends on its severity. For instance, in its earliest stage (known as gingivitis), the disease can often be treated and reversed with expert periodontal cleaning. Removing the bacteria from underneath your gums will allow them to heal, alleviating the bleeding and inflammation that accompanies gingivitis. When gingivitis is ignored long enough, it can progress into moderate gum disease that can no longer be reversed. Moderate gum disease involves more severe erosion of your periodontal tissues, caused by rampant inflammation incited by harmful oral bacteria. Treating moderate gum disease may include periodontal cleaning as well as an ongoing schedule of specialized periodontal maintenance. Severe periodontitis results when gum disease is ignored, and can include the destruction of your jawbone structure in addition to your periodontal tissues. 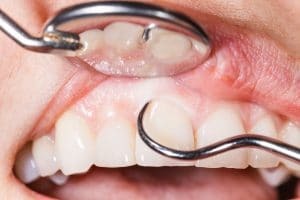 This destruction leaves your gums and jawbone unable to support all of your teeth, and by the time many patients seek treatment, they may need to extract one or more teeth due to inadequate support. Treatment for severe periodontitis may include periodontal cleaning and maintenance, as well as laser periodontal treatment, gum grafting, and tooth replacement. No matter what stage it’s in, controlling gum disease can be essential to maintaining your good oral and overall health. To learn more, schedule a consultation with Dr. Kania by calling her periodontal office in Encinitas/San Diego, CA, at (760) 642-0711.